Heron Park — The Land Group, Inc.
Heron Park is a small, yet significant park along the Greenbelt in Garden City. It is flanked by the Boise River on one side, and residential neighborhoods on the other. Currently, Heron is the only park on the west side of the river in Garden City, which significantly adds to the space's value. The Land Group was commissioned by the City’s urban renewal committee to explore opportunities to develop the park into a neighborhood destination. The Land Group took a step further into this concept by integrating flood mitigation strategies into the user-driven park design. 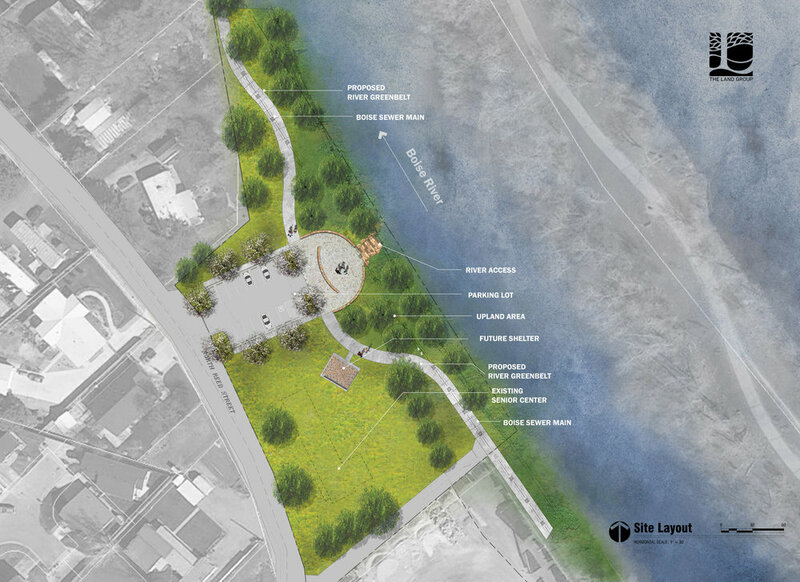 The concept was to regrade the riverbank from a straight-down drop, to a long, gradual slope from the center of the existing park. The “big slope” allows more water to flow through so it slows down the speed at this location. A 3-tier platform and an elevated board walk are proposed to provide access to the riparian zone and river without disturbing the riverside ecology.